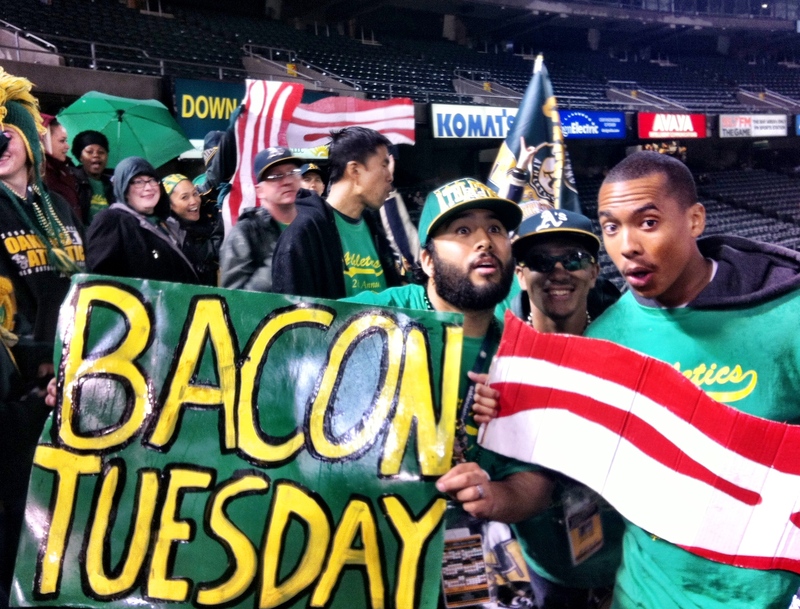 By now, most of you have probably heard a little something about “Bacon Tuesday” last week at the Oakland Coliseum. It was magical. And it represented one of the best parts of baseball: the chance for fun interactions between fans and players. In this case, the crew in the Right Field Bleachers were celebrating a player from *another* team: Jeff Francoeur from the Kansas City Royals. Click this link to check out my live, in-game interview with the organizers behind Bacon Tuesday. Later in the game, I met up again with the RF Bleacher crew for the 7th Inning Stretch. Here’s a link to my second chat with Omar about what’s in store for “Bacon Tuesday 2013.” Notice how it’s gotten progressively wetter and those bacon strips, soggier and soggier. On a night like last Tuesday, the rain didn’t seem to matter. Honestly. We were all having too much fun! The final component to the success of “Bacon Tuesday” was the mutual enthusiasm from the Diamond Vision crew (the team that’s responsible for the big screen, scoreboard and stadium entertainment in general). Hats off to Jeremy Wesler-Buck for creating such fun scoreboard messages so quickly! All of a sudden, cap caper was sponsored by Jeff Francoeur, and strips of bacon seemed to appear between every inning! I especially love this screen (photo below, courtesy of Jeremy) that hints to more fun times next year.